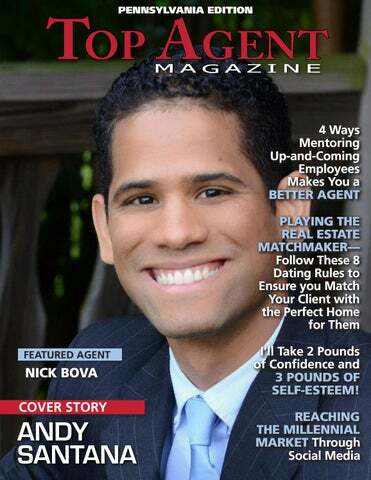 CONTENTS 4) PLAYING THE REAL ESTATE MATCHMAKER—FOLLOW THESE 8 DATING RULES TO ENSURE YOU MATCH YOUR CLIENT WITH THE PERFECT HOME FOR THEM 13) I’LL TAKE 2 POUNDS OF CONFIDENCE AND 3 POUNDS OF SELF-ESTEEM! The future looks incredibly bright for Andy. His positive outlook, deep knowledge of the real estate industry and his incredibly infectious good nature all bode well for the continued exponential growth of his business. For more information about Andy Santana, please call 610-780-3942, email AndySold1000@gmail.com or visit andysellsmore.com www. 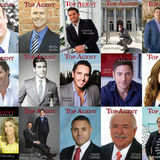 Staying top of mind with all of his past clients is of the utmost importance to Nick. “I use social media daily to market my client’s property and my business,” he says, “I use a contact management system, and make random phone calls and texts to my current and past clients. I take advantage of all the technologies that allow me to stay in touch. I also send out various mailers a few times a year. There’s also a lot of social media interaction with my past clients.” Savvy, cutting-edge marketing is also intrinsic to Nick’s continued success. Among the many tools he utilizes to push his listings front and center are professional photography and video, drone videos, and copious social media marketing. “We treat all our properties as events,” he says. “We put forth a comprehensive social media campaign, and we go through a hundred-point checklist of things to prepare. Helping people through a real estate transaction - which at times can be complicated - is what Nick finds most rewarding about his chosen profession. “Homeownership is the American dream,” he says. “When I bought my first home I was excited, and I remember thinking about how I can improve the process. It’s incredibly rewarding to see the end result of a buyer or family being completely satisfied in their new home.” When he’s not working, Nick enjoys spending time with his family and traveling when work circumstances permit. He is also active in his community, and as a member of the Pleasant Hills Lion’s Club he participates in multiple charitable activities that include food drives, and various fundraising events. As for the future, Nick is planning to continue to grow his business, and will soon be adding additional members to his team. He will also obtain his Associate Broker’s license in early 2018. Nick will always remain extremely grateful for the support from his past and present clients. “Without them I wouldn’t be nearly as successful,” says Nick.